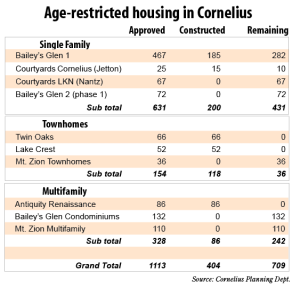 The number of age-restricted residential developments in Cornelius continues to grow. The Cornelius Town Board unanimously approved a conditional rezoning request for 103 more single-family homes for seniors in the Bailey’s Glen development in the southeast corner of the town. This is in addition to 72 new lots approved last year. Bailey’s Glen already has 372 homes and 96 condominiums on 145 acres. Cornelius has a lot of shades of gray these days. Age-restricted developments are growing on both the east and west sides of town. They’re viewed more favorably in terms of burdening municipal resources and services, said Commissioner Dave Gilroy. But is new residential development, in any form, precisely the way to go when more companies are opening in neighboring communities like Mooresville, Davidson and Huntersville? Michael Waltrip Raceworld has closed and Curtis Screw Co., one of the last reminders of Cornelius’ old manufacturing base, is moving to Iredell County. “Our tax base remains stuck at approximately 85 percent residential and too many of our citizens need to commute to Charlotte or elsewhere for jobs,” Gilroy said. Cornelius is getting grayer by the minute. U.S. Census data shows that Cornelius’ over-65 population grew 132 percent between 2000 and 2010. According to the Census Bureau, 8.38 percent of Cornelius’ population was 65 and older in 2000. Ten years later, 10.11 percent—of 24,800 people—were over 65. Of course, the 2000 population was only 12,932. Meanwhile, baby boomers are aging in place here, and moving here. Epcon Communities is expanding from just one active adult development on Jetton Road Extension, to another one on Nantz Road. The Courtyards at Lake Norman will have 67 homes designed for ages 55 “or better.” The maintenance-free, ranch-style homes start at around $315,000. Mt. Zion United Methodist Church, on the east side of town, plans to expand its senior living campus. The town’s approval of more units in Bailey’s Glen was accompanied by a list of 14 conditions. Developer Jake Palillo had previously indicated it would take about 18 months to start construction after town approval. He estimates the homes will range from 2,000 to 3,000 square feet depending upon the model and will be priced in the $350,000 range. With the approval, the town now has approved a grand total of 1,113 senior age-restricted homes. Some 631 are, like Bailey’s Glen, single-family homes; 154 are town homes, and the remaining 328 are multi-family/condos.